Elboxrf awarded a contract from The Department of Telecommunications of AGH-UST (University of Science and Technology, Krakow) to design, develop and manufacture the Radio Frequency Identification System. 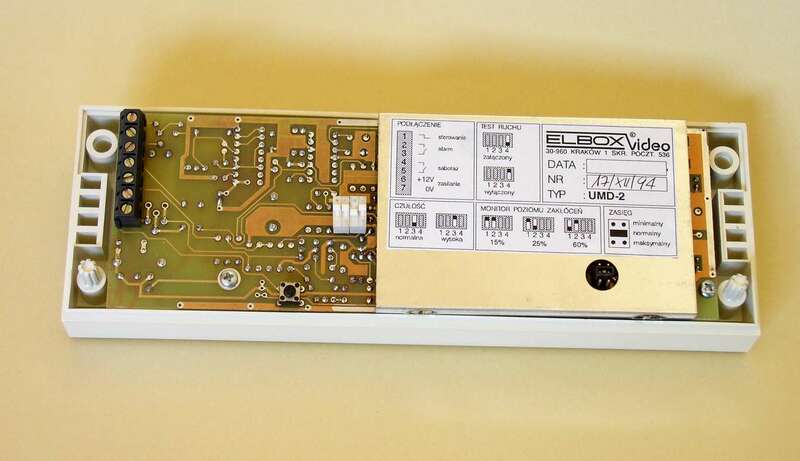 During the work, Elboxrf developed an original system for tracking an active RF tags. The system consisted up to 255 transmitters, microstrip antennas with integrated RF preamplifier, and the five-processor central unit with RF receivers. 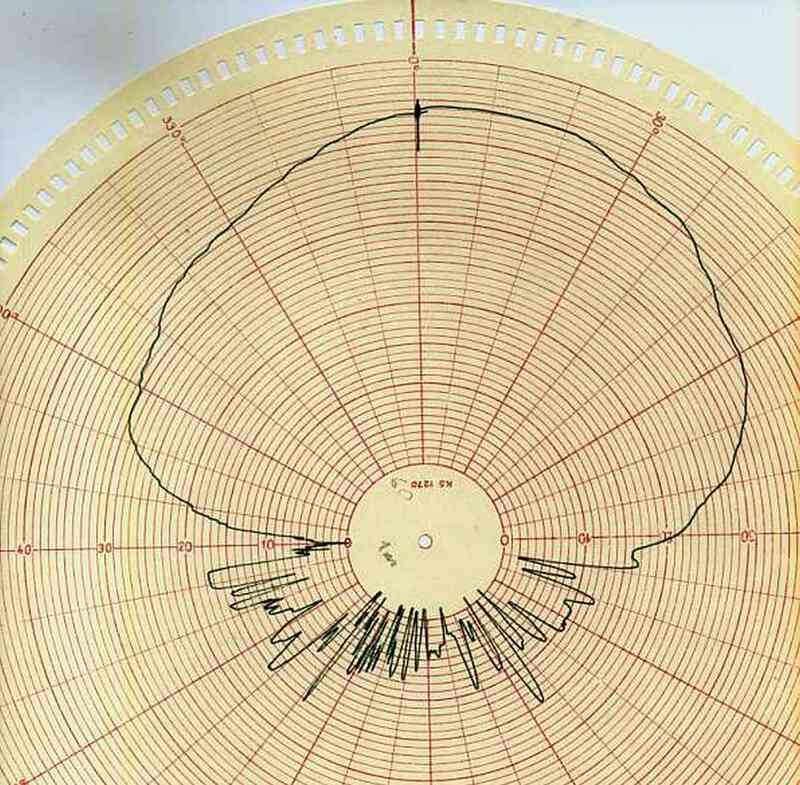 On the test site this sophisticated system was able to count without errors all units attached to the mining crash helmet worn by two groups of miners. The system then inform the operator about number and direction of evacuation of each miner. Below: an active RF Tag and a part of a control unit. 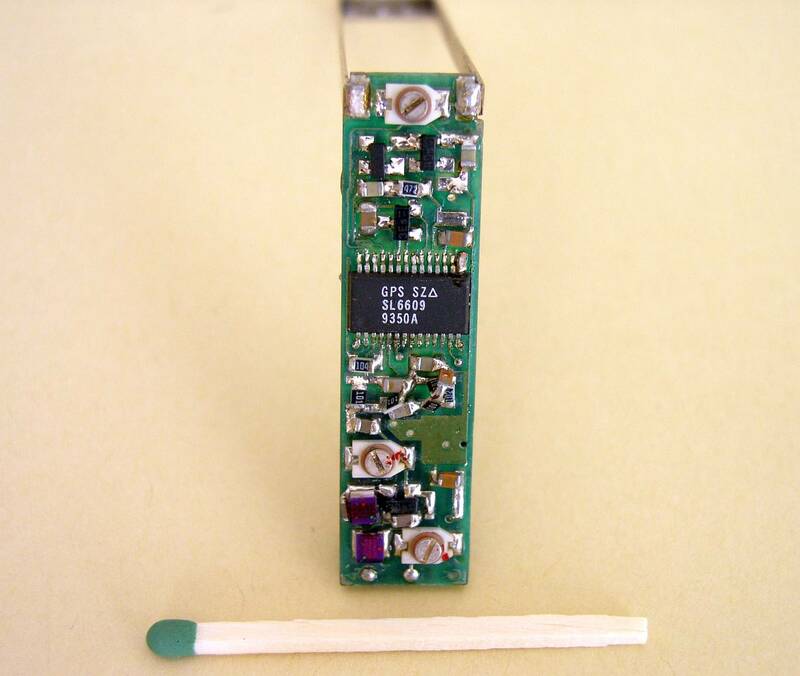 This tiny battery-operated transmitter was designed to have no less than +10 dBm transmit power in the 433 MHz ISM band at DC voltage between 2.5 - 3.5V. At this side you can see the PIC16C54 uController from MICROCHIP, the MRF2006 IC from HEWLETT-PACKARD and the Surface Acoustic Wave component from RFM. The whole unit was carefully screened and immersed in a epoxy resin. The average Icc was about 2 mA. The remaining fifth processor was on the radio board. 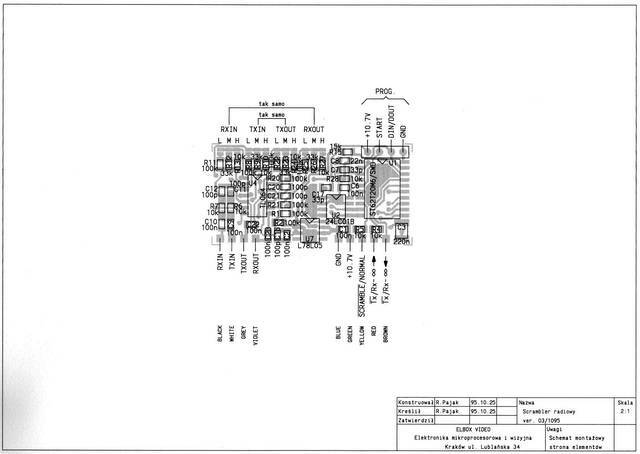 MICROCHIP is a registered trademark of Microchip Technology Inc. HEWLETT-PACKARD is a registered trademark of Hewlett-Packard Co., then Agilent Technologies, Inc., now Keysight. 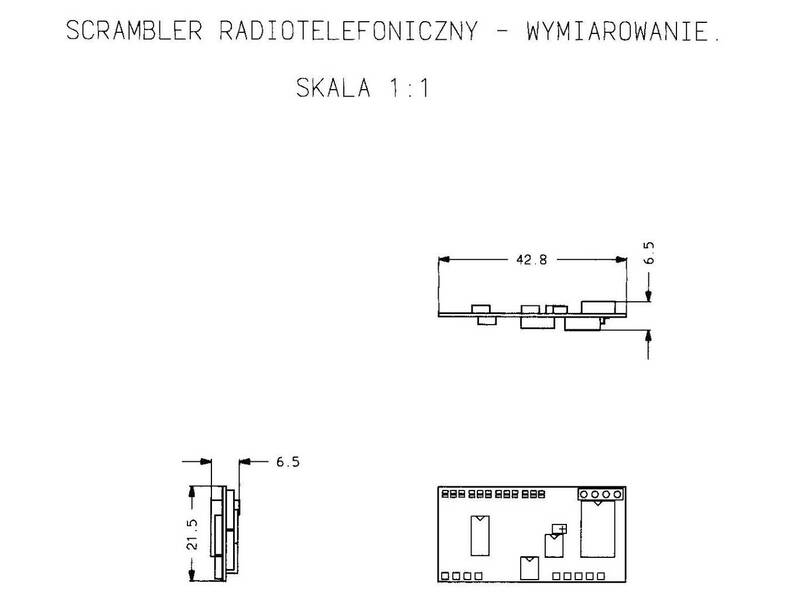 RFM is a registered trademark of RF Monolithics, Inc.
Elboxrf received an order for developing voice-scramblers for upgrading ready-made radiotelephones. After a few month of work we designed the range of programmable voice-scramblers. The most advanced unit was dimension of 43x22x6.5mm. It was in form of two-sided PCB with elements on each side. 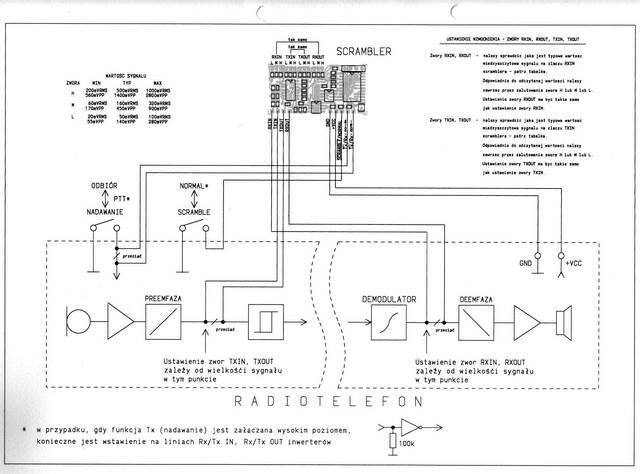 This scrambler was equipped with a voice codec, modem, EEPROM, DC-stabilizer, uController and the programmable socket. It was a real effort to develop schemes for the coding sequence and for the synchronization algorithm. As a result the voice transmission was undistorted and the very difficult for descramble by unauthorized person. Also synchronization was so fast, that the user does not know when the transmission was switched to coded mode. This work was very important for many next Elboxrf's projects including 433 MHz radio modems, developed in 2000. The data transmission was synchronized immediately, even when the decoded signal was very noisy. 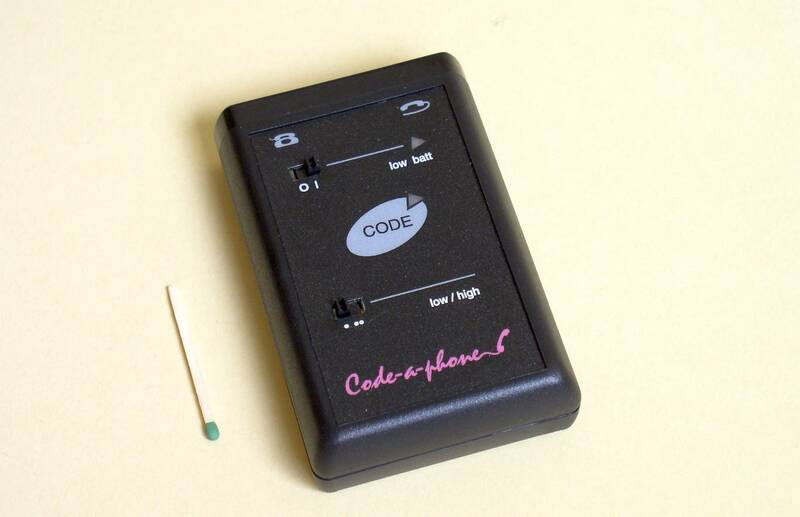 We developed also the CODE-a-PHONE, a full duplex voice-scrambler for telephones. The radiotelephone's button "push-to-talk" was utilized for switching internal circuit in the scrambler. ... after removing a bottom cover. 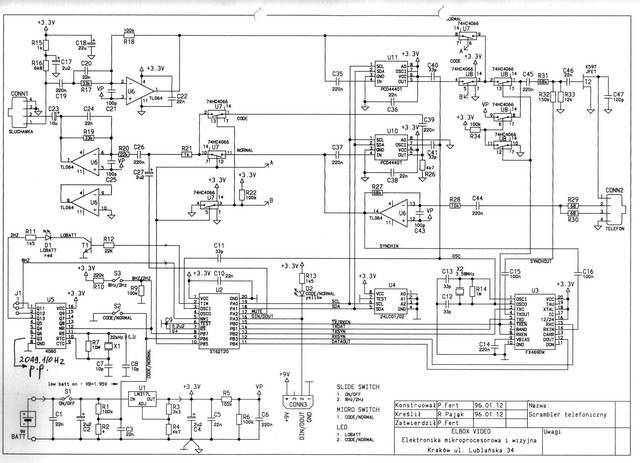 You can see the piggy-back module; the fsk modem and logic. 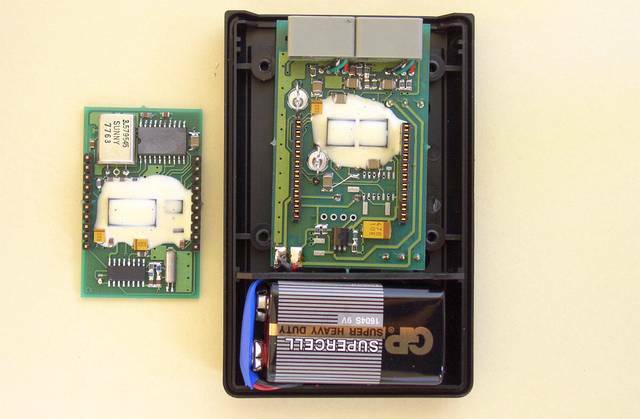 The covered by a epoxy-resin elements are uController ST6220 from SGS-THOMSON and two integrated scramblers - PCD4440 from PHILIPS. The central button is for activate the scrambler at any time during the telephone conversation. At the right are LED's. SGS-THOMSON is a registered trademark of SGS-Thomson Microelectronics; now STMicroelectronics. PHILIPS is a registered trademark of Royal Philips Electronics N.V.
1993, May - Elbox received a found from The State Committee for Scientific Research for his Local Paging System. Under the contract - No. 0575/C.S5-8/93 - Elboxrf developed the small PC-operated control unit, a low-power RF amplifier and the numeric one-way pager receiver. All the work were finished by the April 1994. 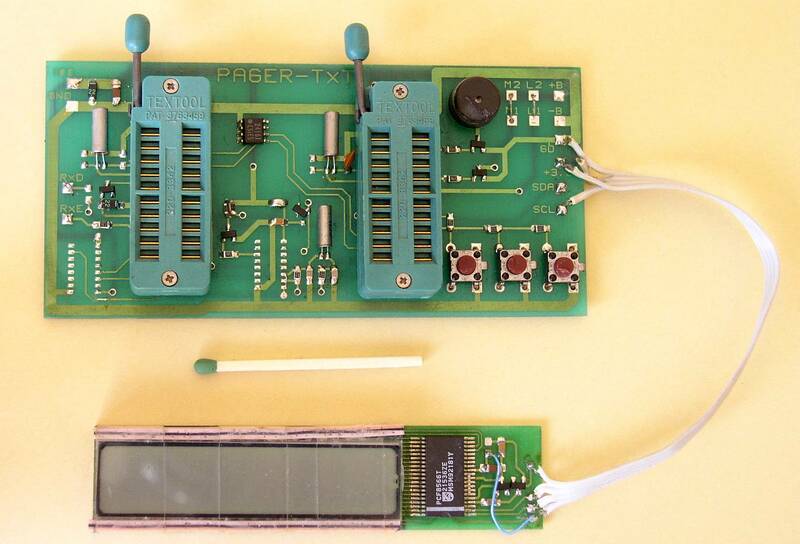 After two years of preparing, we developed some of prototypes of pager receiver. 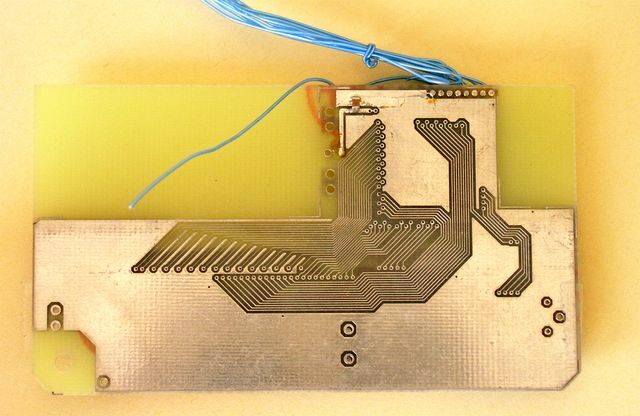 We evaluated various types of RF receiver - heterodyne system, offset IF and ZERO IF systems, antennas - loop antenna, printed loop antenna, ferrite antenna with one-turn high-Q coil, and various display systems. 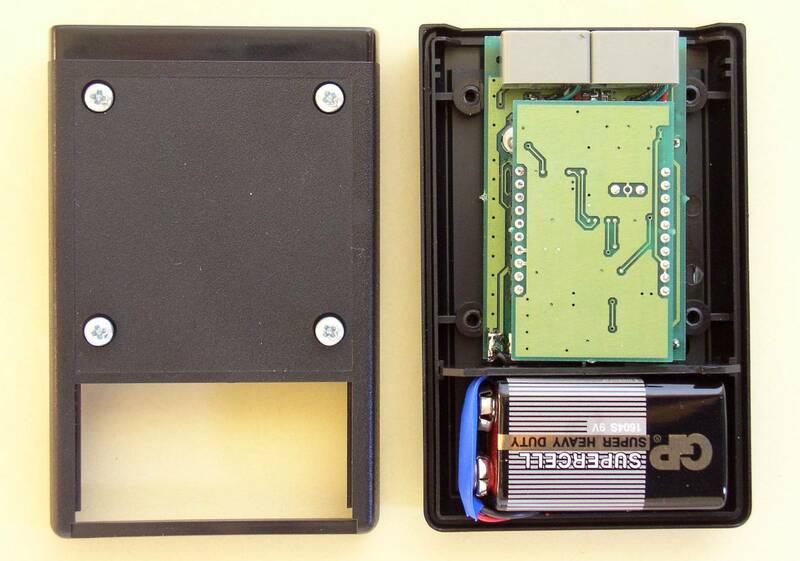 All pagers were designed for the band 160 MHz. Superheterodyne receiver with two IF frequencies. The first IF is about 21 MHz and the second IF is the standard 455 kHz. (This filter is removed). 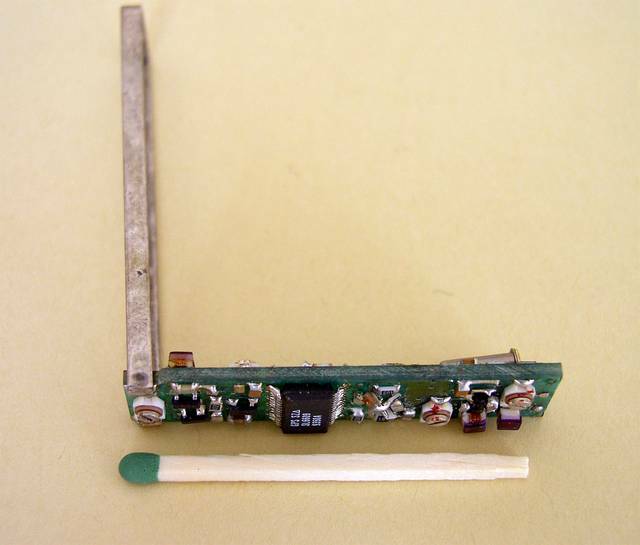 This receiver based on the MC3367 integrated circuit from MOTOROLA. 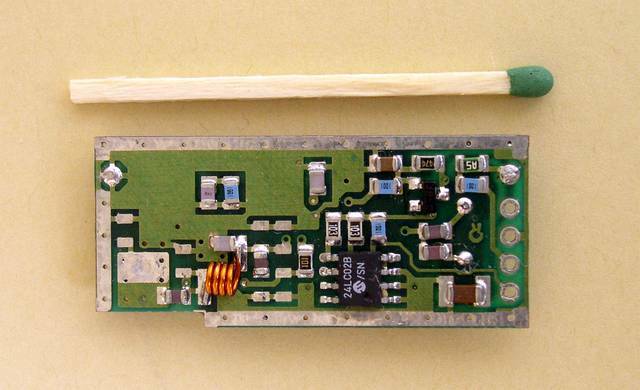 An antenna, an RF preamplifier and a DC-switch for an IC. 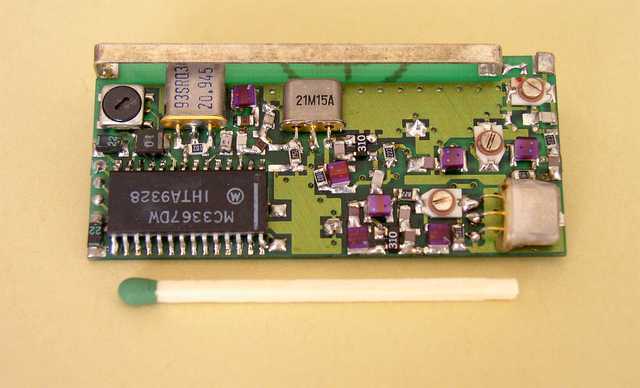 An RF preamp., an IC and the local oscillator. 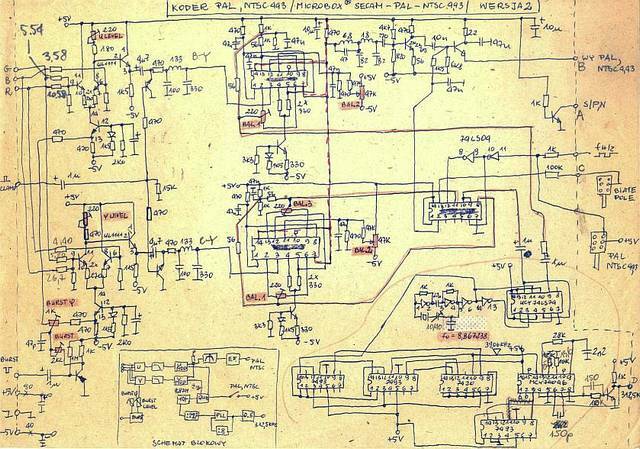 As far as I remember it, the first was for acquiring & decoding, the second one for other logic - buttons, an vibrating motor, a buzzer and a micro incandescent lamp. 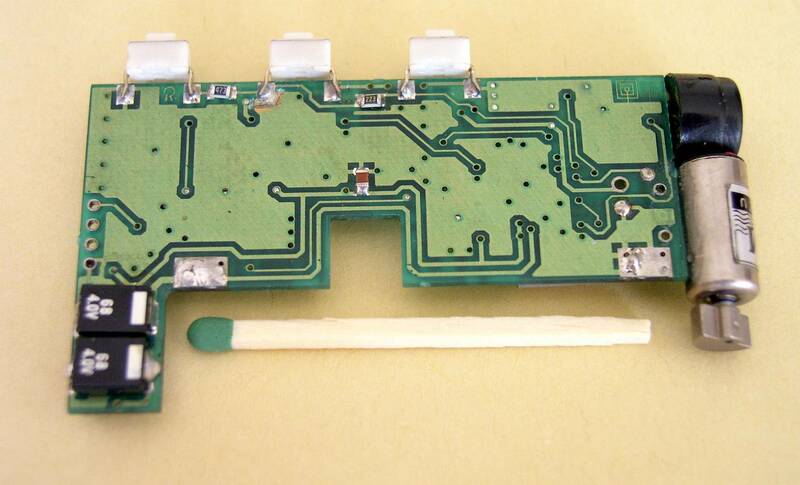 In this particular PCB uControllers are removed. 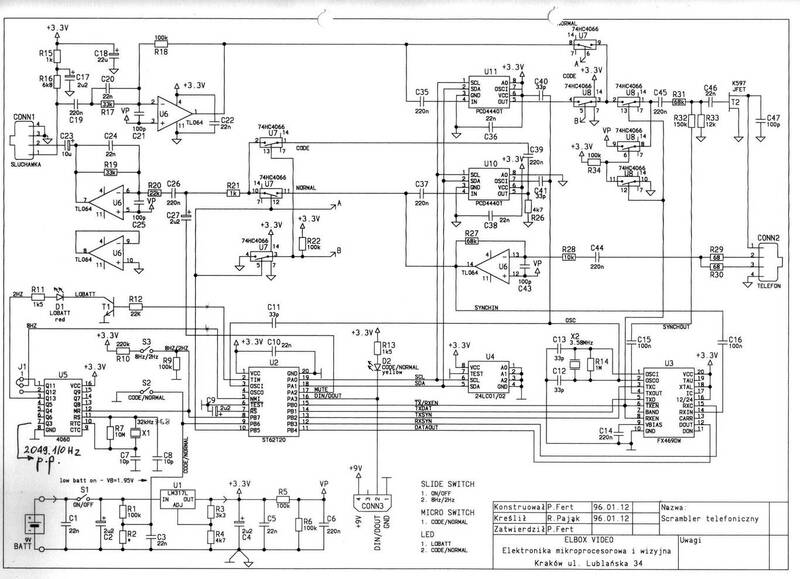 At the bottom right is a DC-DC converter. This project was beep only pager - the Beeper. 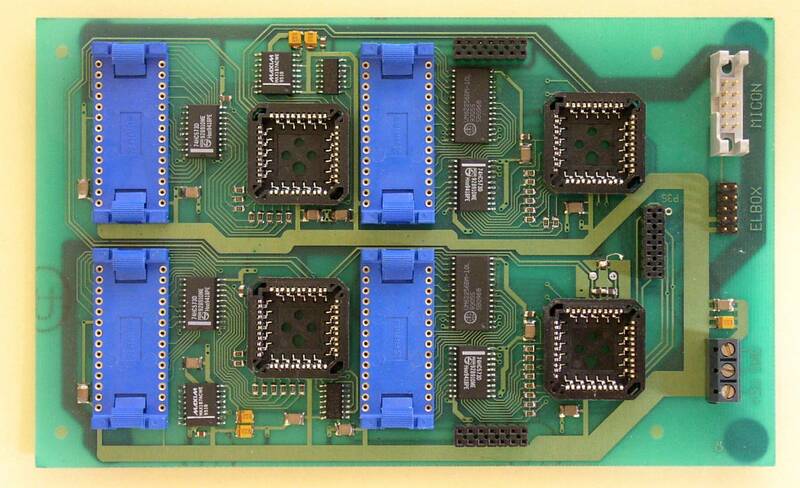 We implemented the ST6220 microcontrollers from SGS-THOMSON. 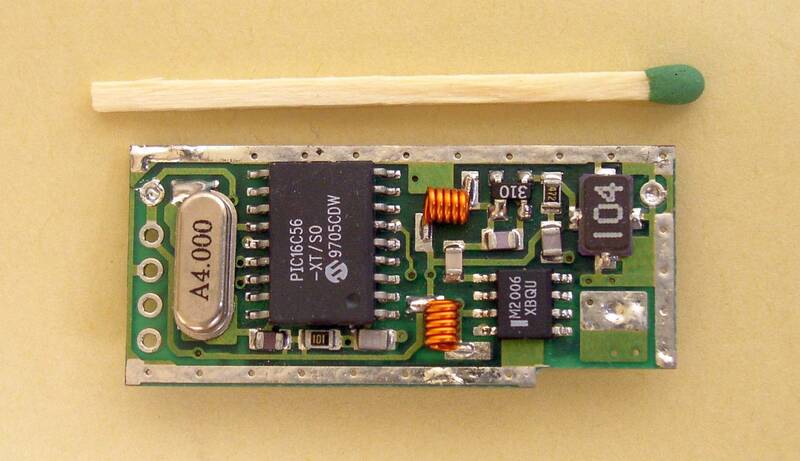 on the left you see two large capacitors mounted underneath the DC-DC converter. this was the only way to suppress the noise from this converter. 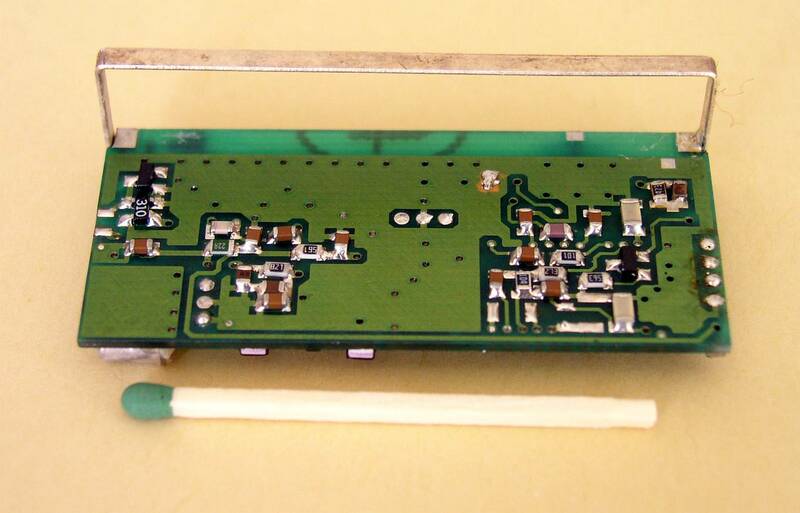 The RF part - on the separate board, was mounted at this side. 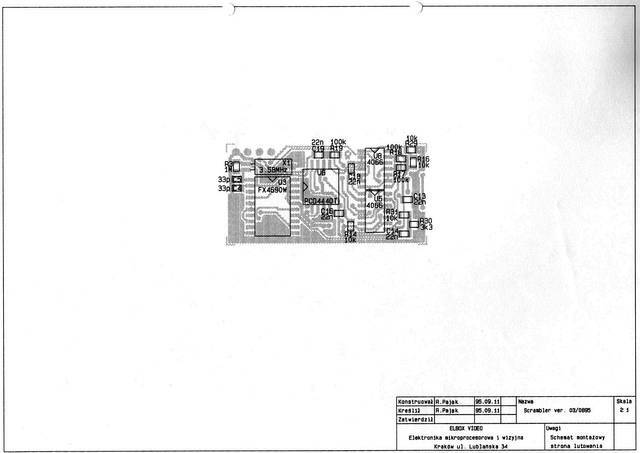 This PCB side was designed to have a large ground area; remaining tracks are DC-only. Designed in Elbox the evaluation board for PCF8866 IC LCD controller and a LCD itself. The above PCB is a evaluation board for alphanumeric/beep pager. The one 7-segment from 8 characters LCD mimics an letter. The PCF8866 come from PHILIPS. 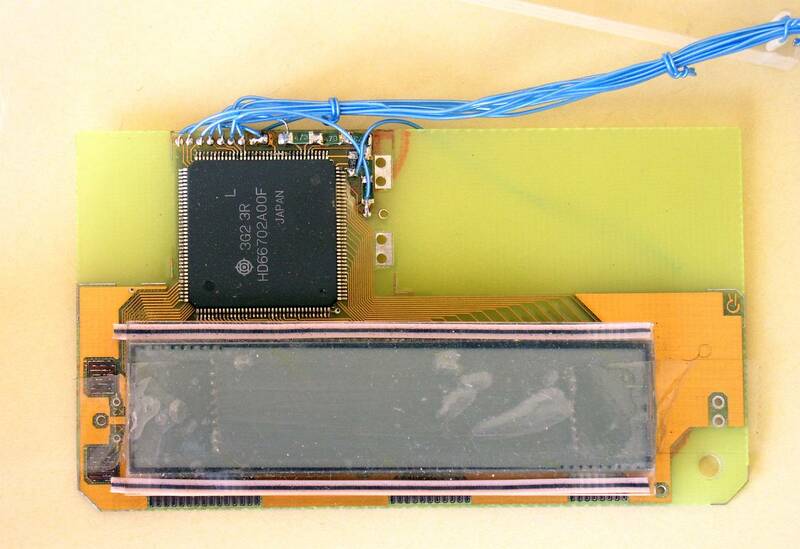 Completed LC display and an controller - HD66702 from Hitachi. It was probably the first ever commercial available 5x7 and 5x10 dot matrix liquid crystal display controller and driver - January 1992. We received a sample from Japan. It was assembled by hand. Completed LCD and the controller. A bottom side. 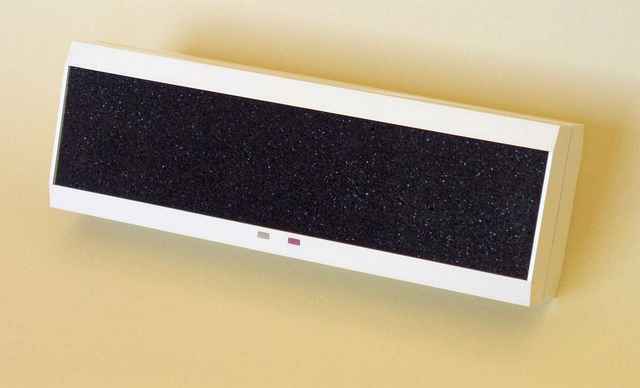 PHILIPS is a registered trademark of Royal Philips Electronics N.V.
Ultrasonic Movement Detector - a black part is the cover foam. 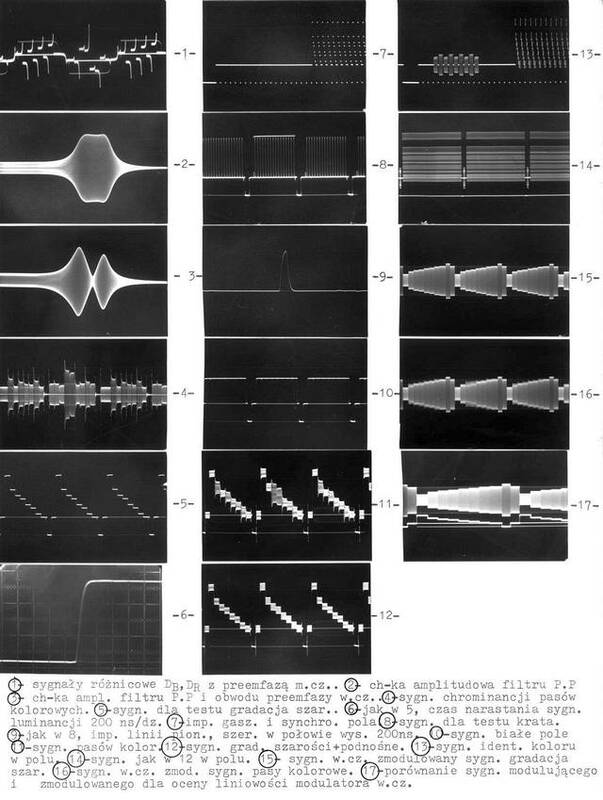 Because it should be transparent for ultrasonic waves it took some time to find the proper material. The inside view of this detector. The version on a picture is equipped with some useful functions: movement test, sensitivity and a range switch and a interference level monitor with a memory. 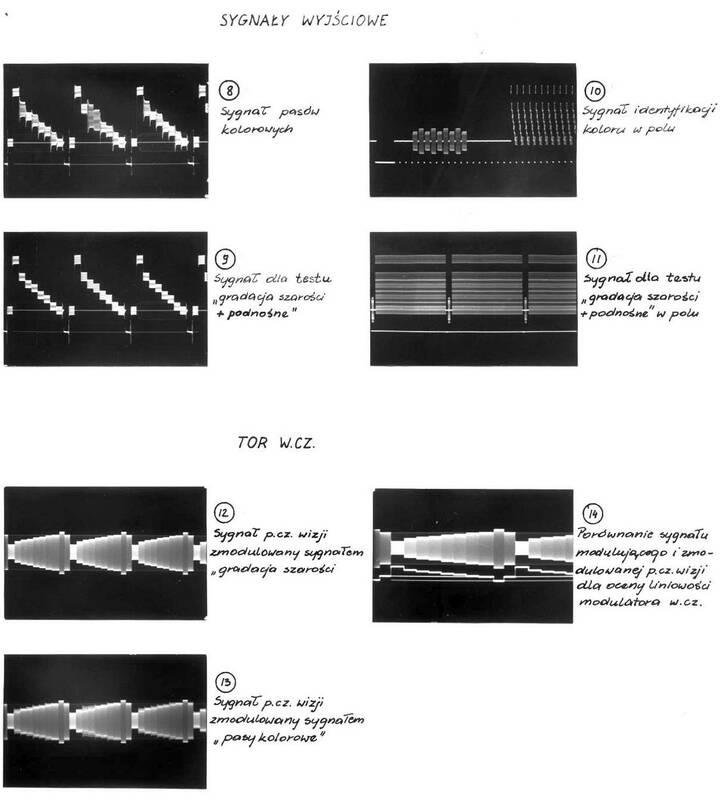 Here, the ultrasonic radiation pattern. An element side of the PCB. 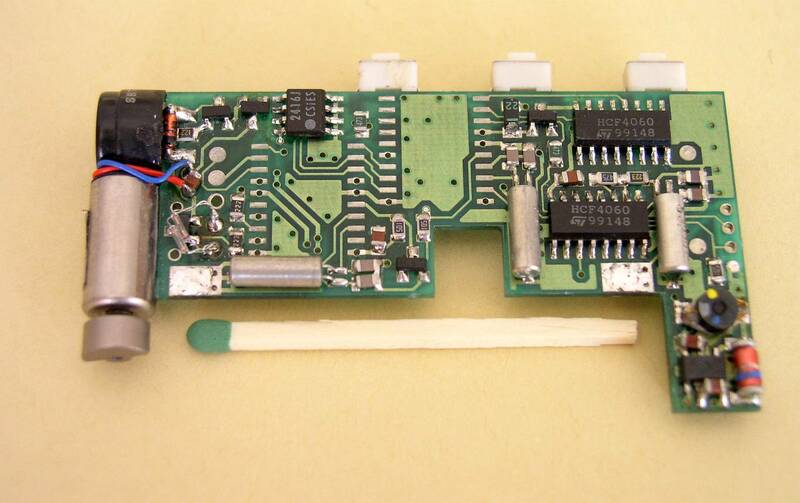 Two transducers, two LED's and other elements. 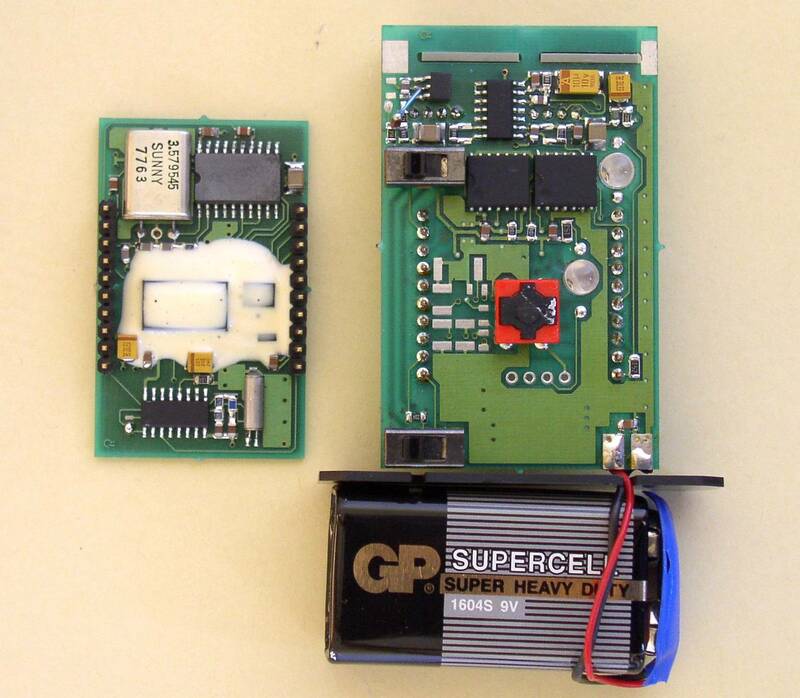 The MICROBOX SG was introduced - SECAM, PAL and NTSC signal generator. Subcarriers were stabilized by the switching Phase-Locked Loop (PLL) unit, coupled to the crystal (Xtal) oscillator , so colour bars on the TV-screen had always the right and within the specification colours. 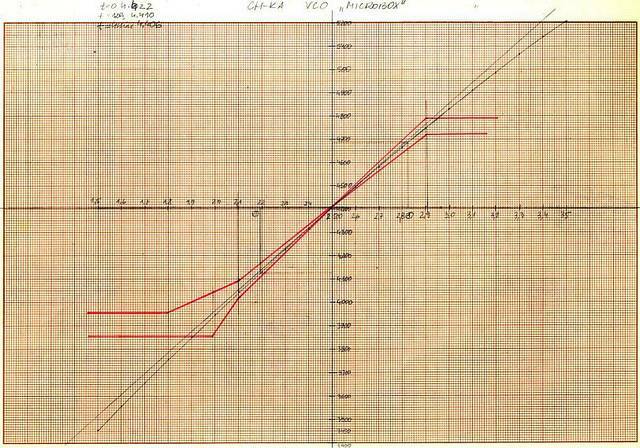 Subcarrier frequencies were temperature and aging independent. By the end of the year it was equipped with a PAL / NTSC coder and other logic circuitry for generating the full Bruch Sequence (from Walter Bruch, a German electrical engineer) - a 4-field blanking sequence generated in PAL coders to ensure that burst phase is the same at the end of each vertical interval. 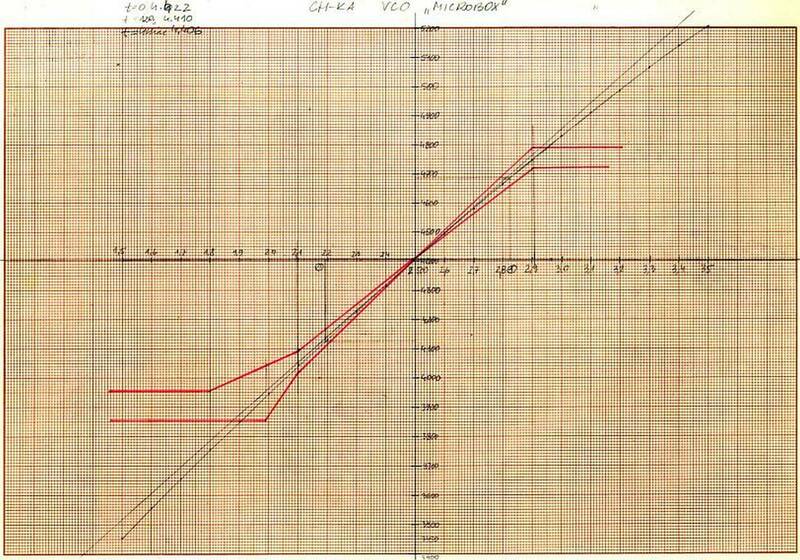 And finally the VHF/UHF modulator was designed - the whole unit was lightweight and measured 24x11x5cm. 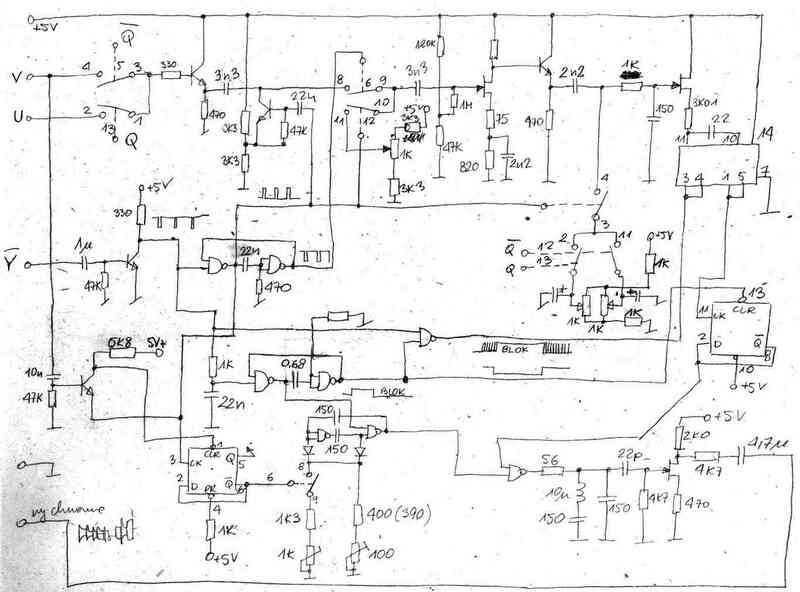 Before the Computer-Aided Design (CAD) era becomes popular, the first step to design the logic circuit, was to draw a logic waveform. 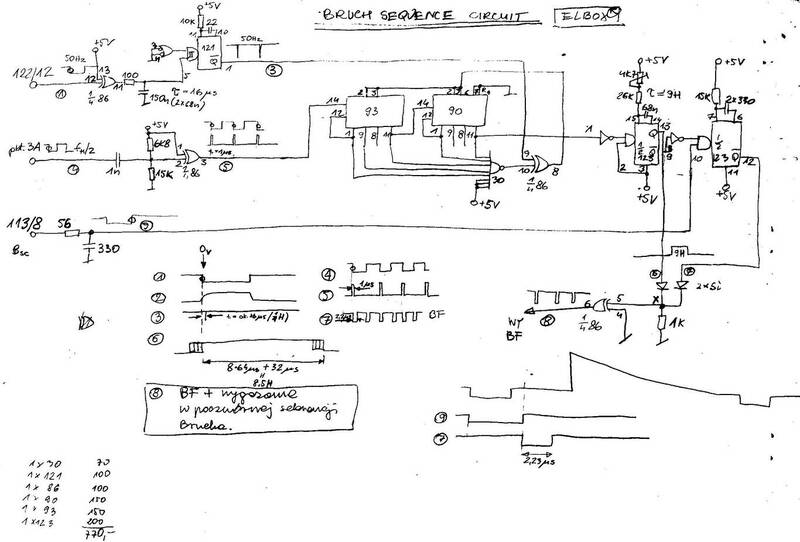 Here is the 4 TV field Bruch sequence timing chart in its entirety. Circuit diagram of a Bruch Sequence generator. Red lines are the SECAM subcarriers mask. 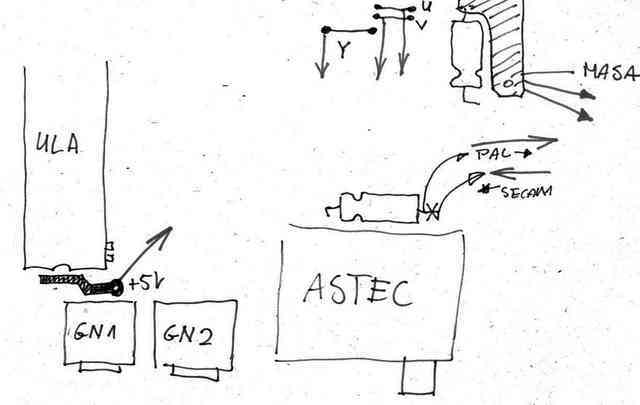 The longer line is the ideal characteristic of an VCO. The slightly curved line is the real f/v characteristic of the VCO. 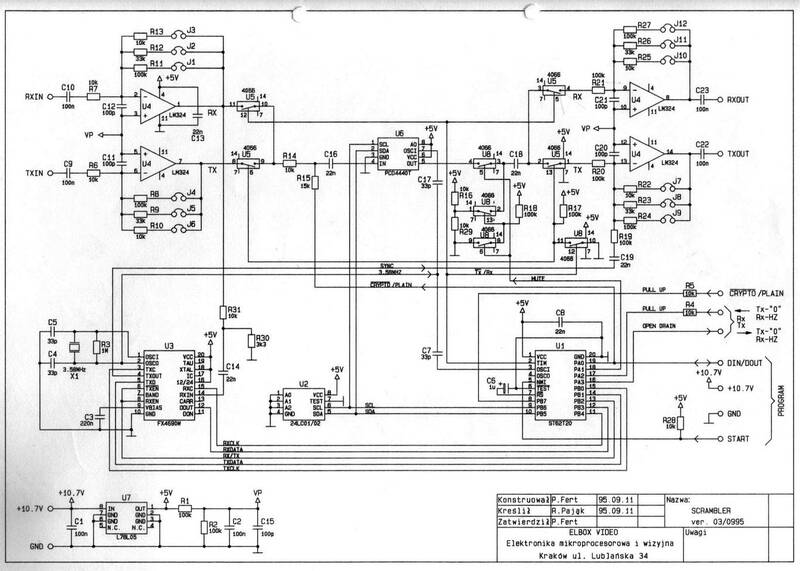 A highly linear VCO was important to generate a high quality subcarriers in the SECAM coder. After some experiments we found that the above circuit was simple and had a linear f/v characteristic. But the DC-current was... 54 mA at 5V ! After few month of work the prototype of the SECAM signal generator was designed. 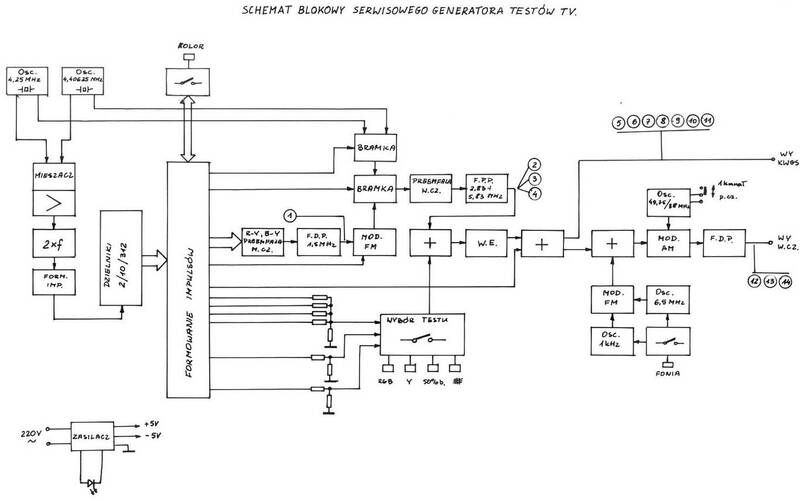 This early version had only a baseband SECAM output, and a very simple VHF modulator tuned to the one RF-TV channel. Numbers in small circles correspond to waveforms. 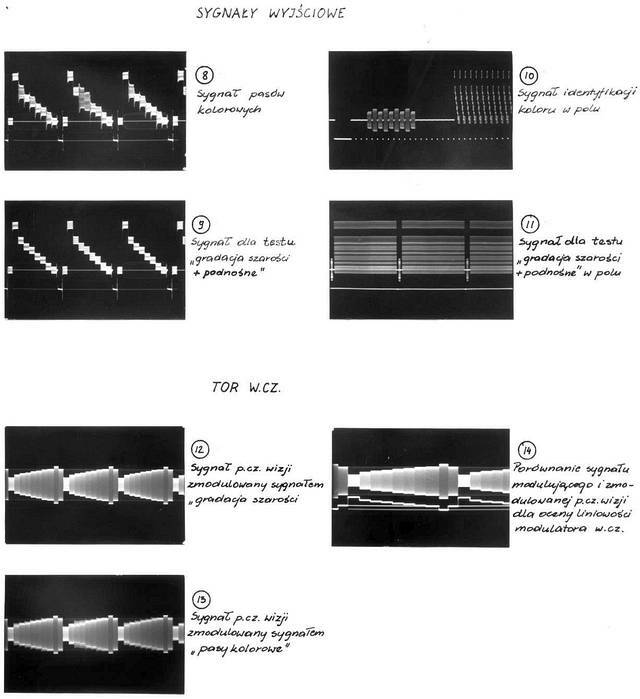 All of them are photographs taken from the original MICROBOX (the name of this generator) user manual. 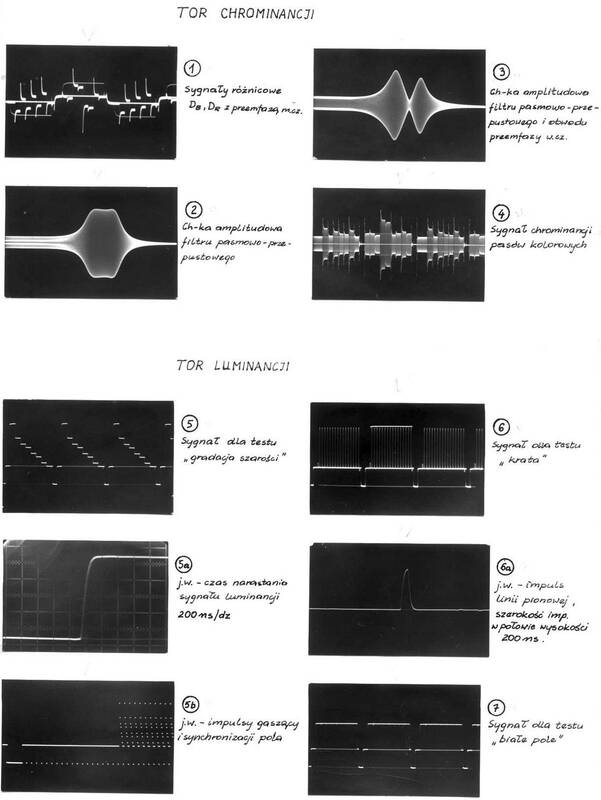 Despite of that descriptions are in Polish, some of you will recognize this waveforms. 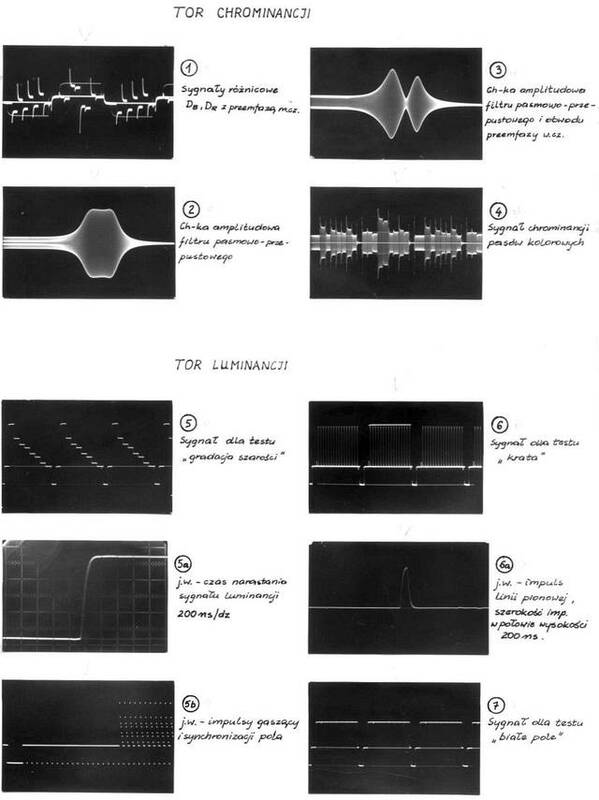 Oscilloscopes waveforms of colour subcarriers and the luminance. 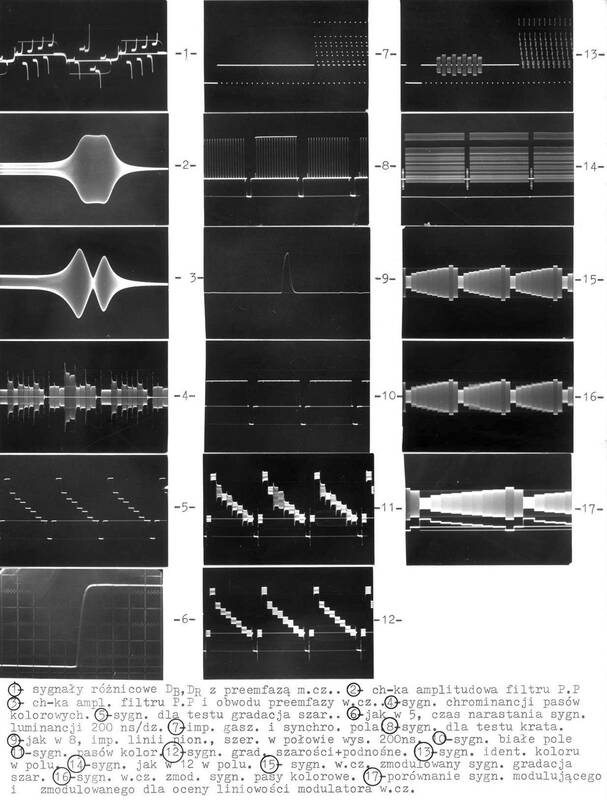 Oscilloscopes waveforms on the outputs: baseband and h.f.